Stopping people from looking down on his work by bringing it to eye-level is Margate's own Linocut Boy, whose colourfully odd floor-to-wall prints are made via the kinda age-old technique of chiseling lines into lino, smearing them with ink, then screen-printing them onto high-quality paper, so the Sunday Sport's safe for now. Pictorial carvings include a fair slew involving awe-inspiring facial hair (a "Beards of the World" collage featuring favorites from Berlin's World Beard Championships; "Beard-Tie", depicting a man who's fashioned neckwear… from his neck), plus the meter-wide "T-Rex With a Handbag" and a monochromatic portrait of Brit wrestler King Kong Kirk, currently being remade in all his 25-stone glory by Peter Jackson. 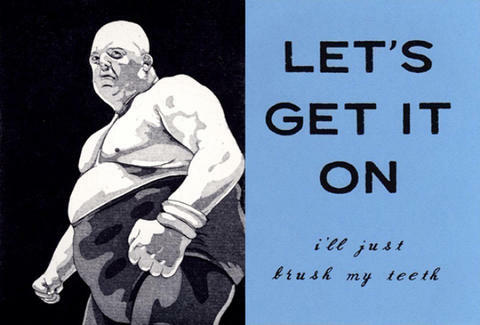 Slogan posters cover oral hygiene ("Let's Get It On [I'll just brush my teeth]"); positive-thinking pessimism ("Failure Is Always An Option"); and the artist's own "tempered response to adversity": "Bring It On (One at a time please)", because renting the entire cheerleading series at once is really an admission of that aforementioned Option. For those thinking "I could do better than this guy", and/or "I hate lino and want to damage it", the artist has just made available packages involving cutting tools, ink, roller, and actual lino -- and here you thought the day you'd actually enjoy the stuff would be the day they found a WWII bomber on the moon.